I have never feared souffles. They are the one French dish I have always made. I think it is because Audrey Hepburn in Sabrina got to understand souffles, and of course, I wanted to be Sabrina when I was a teenager. Click on to watch this scene. A woman happily in love, she burns the soufflé. A woman unhappily in love, she forgets to turn on the oven. When I was a vegetarian souffles were my go to meal for company. A beautiful cheese souffle was proof that you could eat gourmet and not eat meat. As I moved away from vegetarianism I turned more toward chocolate souffles... because what can I say, I knew they would impress my guests. Well, as I have gotten more comfortable with cooking I no longer feel the need to impress my guests with something seemingly difficult like a souffle and I got away from making them. Note: I did a few things differently than Dorie's recipe. One, I grated the cheese in a food processor instead of cutting it. Oh, yes, I couldn't find French Muenster, so I used Comte... and I did not strain the béchamel through a strainer, no need. I also didn't cool the béchamel sauce before I added the cheese and the egg yolks. I let it sit while I whipped the egg whites but that was only for a few minutes. To me the key to a good souffle is to gently mix the egg whites in... fold until just incorporated, even if there are still streaks of white. Don't over mix it and let the air out of the egg whites. My souffles were golden brown in 17 minutes... so watch them carefully through the door. I agree with Dorie, DO NOT OPEN THE OVEN! Thanks Winnie, you must try they are truly heavenly. Your souffles look prefect. I had a couple of souffle failures. Trying them again today. Hope they turn out good this time. 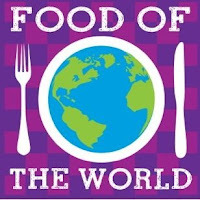 They are just a wonderful dessert to have. The key is to not over fold the egg whites. Mix until just incorporated. I just ordered myself a souffle pan! I'll have to get some tips from you. And thanks for reminding me about Sabrina! One of my favorites, but I haven't seen it in a long time. The larger souffles are harder to make than the individual ones, but it is all about not over mixing the egg whites. Barely fold them into the bechamel sauce. I love both the original and the remake, but in the remake she is a photographer not a cook. I like the cooking school idea more, especially for a reason to go to France. I'd forgotten about the souffle in Sabrina - what a terrific link up for this recipe. I really hadn't thought of the movie in a long time, some how it just came to my mind the line she saids, "Well, I did go to culinary school... 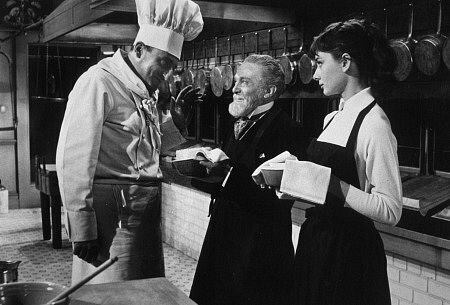 I should be able to whip us up a souffle." something like that. I thought about it too! But I saw your post was already up and went with the very tongue-in-cheek Dark Knight RISES reference. Glad to hear your a Sabrina fan too. I love the Dark Knight RISES idea perfect for Halloween. It looks like they worked out wonderfully for you. I made souffle once before - a delightful citrus dessert; savory will be another first but not today but soon. If you had good luck with sweet you'll do just as well with savory. Don't wait too long. Gorgeous! I wanted to be Sabrina, too!!! Sabrina was just so chic and look at us a couple of chic chicks too. Well, we do alright cooking. Ooh, chocolate souffles. I have yet to tackle them. Now that I'm getting more comfortable with cheese souffles it might be time to move on to chocolate. It is always time for chocolate. I loved Sabrina! I wanted to be Audrey Hepburn! She was just a marvelous actress. Your souffles look beautiful! I loved the Sabrina reference! Nice post, Diane! Yeah, another Sabrina fan. Did you see the remake? It was OK. Love all of Audrey Hepburn's movies and she was such a wonderful humanitarian too. Chocolate soufflé is my favorite kind. Comte is a good sub. Good to hear because I don't know that much about cheese. Gorgeous! I love the Hepburn reference, too. After all, who doesn't want to be Sabrina? I used to make souffles more, and need to get back to it. Simple, you can make them with any seasonings (cheese, vegetables...). I totally agree with you about method. I did actually let the bechamel cool (this time), but don't know that it was necessarily helpful. Wonderful post. Beautiful souffle! They really are just a little more work than a frittata which I make all the time with odds and ends in the fridge... but my are they so much more satisfying. I'm going to make them more too. I love Sabrina. My computer wouldn't play the clip, but the cover photo made me smile, just thinking of her breaking eggs in to the bowl. So cute. 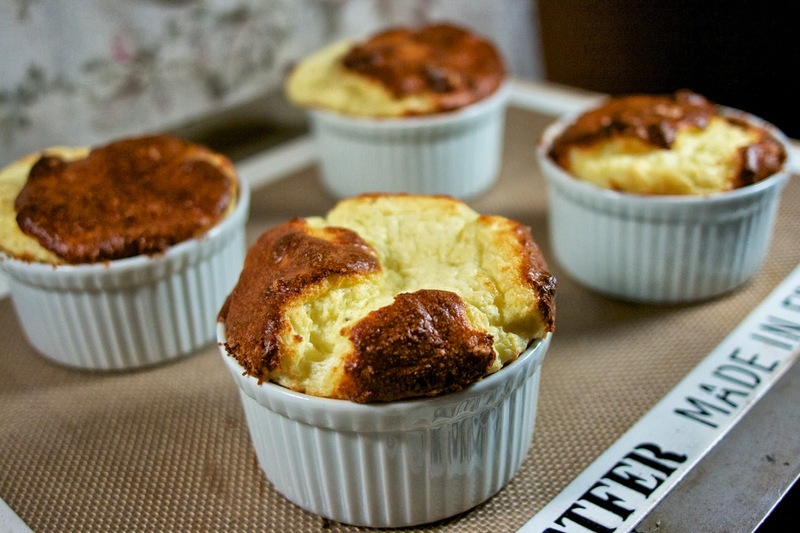 Your souffle looks great, and impressive! I think I need to sit and watch that whole movie. I bet my daughter would love it now too. Souffles are truly the one French thing I get! I love Sabrina too! :) Your souffles look wonderful! That's one dish that I haven't tried making yet.... I'm a little intimidated by them! Yours look so delicious and beautiful! Go for it Maria, remember they are only eggs. These look fantastic! I love souffles and your are beautiful! Visiting from Marvelous Mondays! Thanks for sharing and hope you had a wonderful weekend! Now I want to watch the movie again :) I adored the original and the remake. Audrey was my favorite in the lead but I preferred the guys from the remake over the original. And now about soufflés....kudos to you for being so comfortable. You results show it. Glad you and hubby enjoyed it and funny but typical about the kids wanting the chocolate ones instead. Frankly, now I want a chocolate soufflé too ! I agree guys better looking in the remake. I made a chocolate mousse cake (the one from Dorie) on Thursday and my kids were very happy. These cheese souffles look so delicious they're making me hungry just looking at them! I am stopping by from Wednesday Extravaganza. Have a wonderful rest of the day! Oh Carrie, they were wonderful. I hope you make them. I was wondering if straining the bechamel (such a pain) was really necessary. I'm glad to know it isn't. I'll definitely skip that step when I make these again. Yours look excellent! Thank you Jora. I would only strain it if it turned out lumpy, otherwise I don't see the point. Mmm, cheese souflees! These look just perfect; and actually I prefer stinky Comte (by stinky I mean goood) over Muenster cheese, and it's one of the cheeses that we always have in the house. If I could have found "French Muenster" it is supposedly pretty stinky too, but I love Comte also. I hope you try some souffles. Your Cheese Souffles are just beautiful! Thank you so much for sharing with Full Plate Thursday and hope you have a great weekend! Thanks Miz Helen,,, they tasted as good as they look. So glad to connect with another lover of Audrey and souffles give it a try.